Would you like to do more RV traveling this year but can’t afford it? Then consider workamping, or working for relatively short periods of time in exchange for a place to park your RV and often even for pay. We’ll talk about that I this episode and get great advice from an experienced workamping couple. We’ll also have lots of workamping resources for you to check out. Plus your questions, comments, RV news and much more. Mike and Jen are quite literally snowbound as they recorded this episode of the RV podcast, coming to you from the snowy woods of Michigan’s Upper Peninsula where a Lake Superior winter storm has them hunkered down in their Roadtrek until the roads get plowed. You may be surprised to know they’re delighted with the situation! So is Bo, who was made for the snow. They share their love of winter camping, but admittedly are looking forward to thawing out as they head to Florida in a couple of weeks for some personal appearances at RV shows and a Roadtreking gathering at the Manatee Springs State Park. That’s why the tip we received from a listener named Sue is so appreciated. Sue has a way to have peace of mind that if your pet does takes off, you will be able to easily located hime. Sue suggests aproduct called Link AKC. It sells for $99 and comes in two sizes, one for small dogs, one for large. It’s a GPS system for your pet. 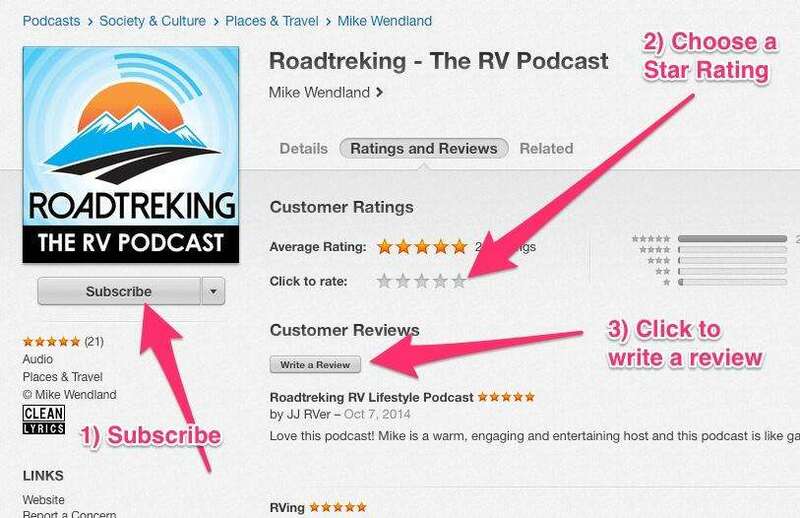 We’ll put a link to them on Amazon on the show notes for this episode at Roadtreking-dot-cm-slash-176. Monica asks: Please talk about how you keep the flooring clean in your Roadtrek. Thanks. Howard e-mails: In your video about using the Reflectix on the window for insulation, can it be used for the windshield, driver and passenger window as well? Barry writes: We have one of the three-way refrigerators that we use almost exclusively on propane. As you probably know they are not always reliable. We would like to be alerted when the temperature in the refrigerator or the freeze strays outside a given range. One we tried recently didn't work and we returned it. Any recommendations from you would be greatly appreciated. Take care and see you out on the road! Mike shares how he has tried three of them and nine work reliably. Batteries die. He has none and is not inclined to try another. As everyone is dreaming about their summer plans, where to go and what to explore, one topic we’d like to dig into today is spending that time volunteering. Right now there are literally hundreds, if not thousands, of volunteers being sought to serve in federal and state lands throughout the country this summer. And the ideal candidate? An RVer. These jobs could be serving as campground hosts at a state or national campground, welcoming campers and keeping track of basic maintenance in return for a free spot to camp. But these volunteer jobs could also range from dressing as a cowboy on a historic cattle ranch out west, to selling merchandise in a gift shop, to living in a lighthouse along the coast of beautiful Lake Superior to helping astronomers interpret the sky for Montana visitors. Right now many federal and state government offices are taking applications for volunteers to work on state or federal land for summer of 2018. Many are specifically seeking RVers – both couples and individuals. While work requirements vary from spot to spot, often the jobs require 32 hours a week volunteer hours for a single person or 24 hours per week for a couple, leaving plenty of time to explore. Some jobs require a month commitment, some require a season, At least one we found requires a year of service. While these jobs are considered volunteer work, most provide a free campsite, and many of those campsites provide free water, electricity and dumping, for as long as you serve. But when you talk to people who do this, they will also be quick to say they provide so much more. Yes, free housing does help the budget, but many who take the jobs also say they provide a great deal of satisfaction that comes from giving back and – in a very real and tangible way -helping to strengthen some of this nation’s most unique parks and historic areas. It could be the adventure of a lifetime. And there are hundreds of volunteer jobs available for RVers. But there are also paid jobs for workampers. A lot of them. Right now, to give you an idea of what those paid and unpaid jobs are like, we want to introduce you to some good friends of ours – Jim and Rhonda Phipps. The Phipps have done just about every kind of workamper job you can imagine. And recently, Mike sat them down and asked them to share their experiences. This site lists volunteer jobs for: U.S. Army Corps of Engineers, National Parks Service, Fish and Wildlife Service, Bureau of Land Management, U.S. Forest Service, U.S. Geological Survey, National Resource Conservation Service, National Oceanic and Atmospheric Administration and U.S. Bureau of Reclamation. Once there you can search and see what volunteer jobs are out there by clicking the state you most want to visit. applications are being taken now for summer jobs. Application deadlines, webpages and phone numbers are also given for each job. When you find the one that interests you, apply for it online. The page will walk you through the five step application process. When more than one couple applies, the agency will look at who is most qualified. It’s here…the culmination of months of gridiron action…the Super Bowl. If your RV is pointed towards Minneapolis, you may want to get into town earlier than Feb 4th. That’s because starting on Friday, Jan 26 and running through gameday you’ll find Super Bowl Live presented by Verizon. This is a celebration of all things Minnesota! From great photo opportunities (including one from inside a snow globe), to larger than life ice sculptures, sleigh rides and even cross country skiing and tubing, you’ll find it all in this mile long adventure located near U.S. Bank Stadium. In addition, if you’re a food lover, come taste some great local fare from food trucks like Butcher Salt, Gastro Truck, MN Nice Cream and more. In fact there’s so much food – more than 100 offerings – you’ll fill up well before you’ve run out of choices! And once you’ve properly pampered your palette, it’s time to give your other senses a treat by checking out the free live concerts playing on the Verizon Up Stage. There you’ll find Minnesota music legends Jimmy Jam and Terry Lewis along with Idina Menzel, Dessa, The Steeles and the Jets and much more. It’s a fun-filled, action-packed 10 days you won’t want to miss. I’ll be working to bring you all the sights and sounds from on site and help showcase what’s going on each and every day.